This past week-end I was inspired by Susanna (thank you!) to finally put the brown paper wine size bag she gifted me to good use for a new art journaling project. I wanted to discover how re-purposing this type of bag for creating an art journal would be different from the common paper bag technique I usually use. 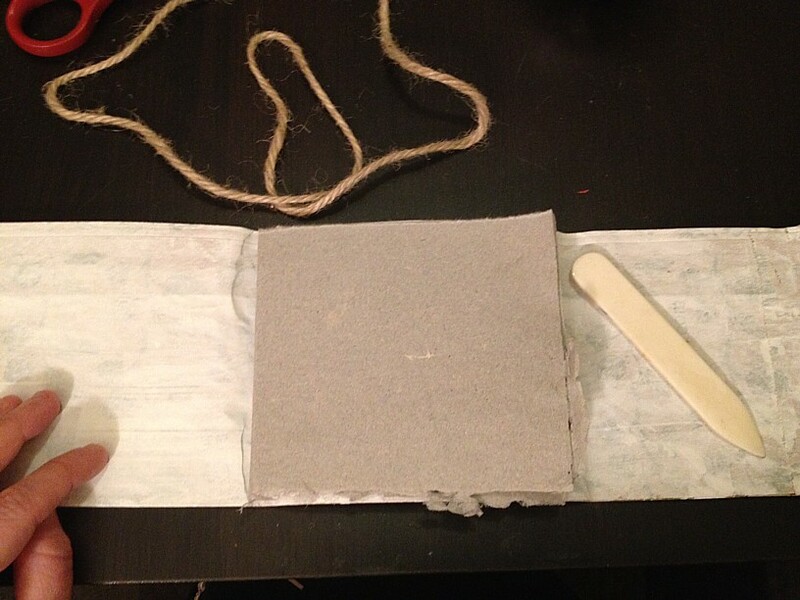 Susanna graciously sent one paper bag already gessoed…which made starting this mini art journal even easier. (step 1 done!) 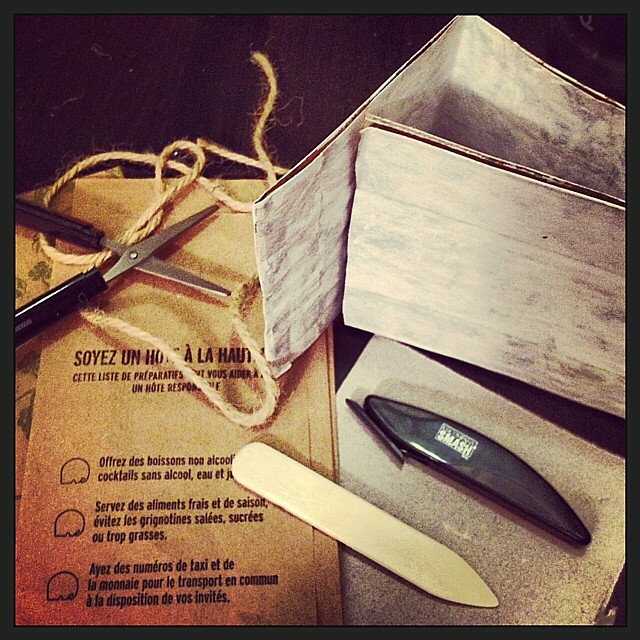 I gathered some handmade paper, a bone folder, some twine, my SMASH cutter & scissors, as well as a paper punch to put it together. With the paper bag flat on the table, I folded an insert of the handmade pages to place in the center. Then I folded the sides of the bag towards the middle and over top one another, which created the book’s cover. The open edges of the bag (on the right side I used my SMASH cutter to open the bottom of the bag) create cool pockets for discreetly stashing stuff in. 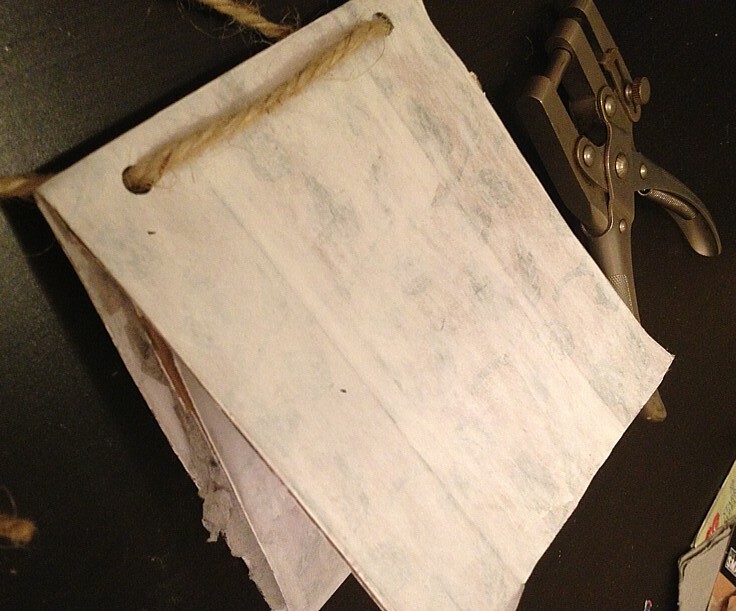 I used a paper punch and twine to bind the pages and book together. To start, my paper insert has enough pages for 5 spreads, but lots of room to add more. The concept of this art journal is dedicated to my self-care, especially in relationship to my trauma work as an art therapist. This miniature book will provide a safe space to explore important considerations to keep myself grounded and refreshed in my work through intention, mindfulness, gratitude, positive affirmation, and of course: creative practice. It was very cool to see this week’s 14 Secrets Challenge focused on gratitude, which was on my brain for a spread in this journal. Check out Lani’s post for lots of “focus-shifting for our peace of mind” encouragement and helpful prompts. 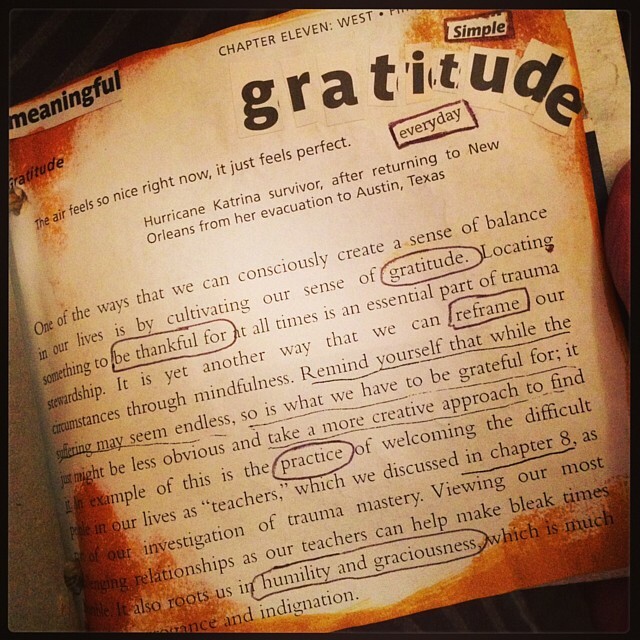 Practicing gratitude is definitely part of my self-care to help me keep centered. I started with an “I AM” SMASH cookie note to visually inspire me to think about what I am grateful for, especially in context to this quote from page 223 about the pain that exists in this world: “Remind yourself that while the suffering may seem endless, so is what we have to be grateful for…“. Struggles can become reframed with intention to discover moments of thankfulness within the experience and help us grow. My response to this quote and the image I created above was to be grateful for the painfully beautiful things (in people, moments, choices, changes) that help us all discover what truly matters. I am also grateful for co-workers, friends, significant others, & family in my life that help support me in discovering this, as well as the women and children I work with. I enjoyed using this kind of paper bag to begin this new art journal- especially with the inclusion of pages and how the bag serves as a comforting cover wrapping around them. I’ll continue to add to this self care art journal, its pages, and cover with additional content and inspiration to keep sharing with you! 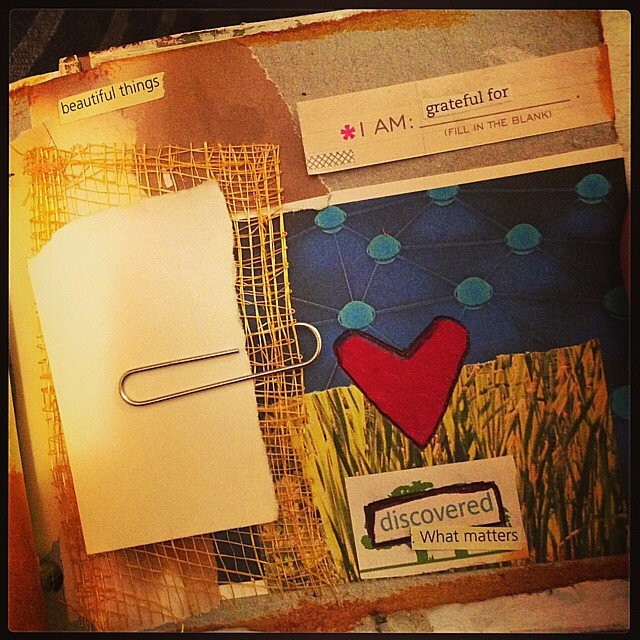 This entry was posted on	May 21, 2013 at 7:47 am	and is filed under art journaling, art therapy, creative people, do something, gratitude, intention, resiliency, self care, trauma. With a full and grateful heart we are poetry in motion!